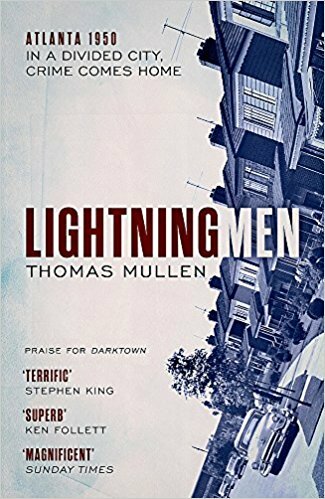 Not having read the first novel in this series by Thomas Mullen, Darktown – indeed, not even realising there was a first in the series – Lightning Men may well have been a struggle in understanding that which has gone before. It isn’t: what Mullen has created in black Atlanta police officers Lucius Boggs and Tommy Smith, along with their white colleagues McInnis and Rakestraw, is nothing short of marvellous. With the racially torn, 1950s Atlanta as its backdrop, here is a history lesson to die for. Taut, patiently created prose drive this story of racial hatred that might in other, less skilled hands, come across as being ‘preachy’. It might also come across as somewhat two dimensional, yet what Mullen achieves within the 384 golden pages of this novel is examine both sides of the arguments he creates, without ever being in any way dictatorial. This allows the reader to follow their own path as to who to side with and who to take up moralistic arms against. Another seemingly obvious trap deftly avoided is that of the stereotype. Each character in turn keeps us guessing as to what their actions will be from page-to-page, making Lightning Men as compelling a read as it is informative and intriguing. It even has us asking questions about our own individual morality inasmuch as it invites us to query “what would we do?”, given that the novel is based in a period many readers will recall; a time where tolerance was simply a big scorer in Scrabble and not a lot else! With beautifully honed imagery, luscious dialogue, a sleight-of-hand which is simply joyous to behold in written form and a story which ties up all the loose ends deftly while leaving a few strands from which a fresh story can be woven, Lightning Men is simply tremendous.